After Jordanian pilot burned UAE pulled out, but now it appears to be redoubling efforts to smash ISIS terrorists. 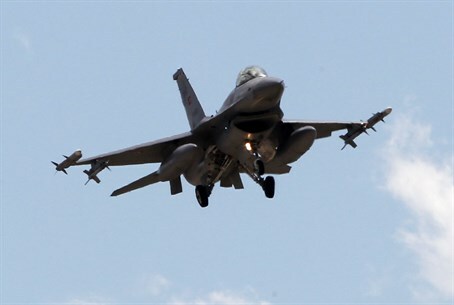 The United Arab Emirates (UAE) on Saturday ordered a squadron of F-16 warplanes to be stationed in Jordan to support it in strikes against the Islamic State (ISIS) group, apparently taking back its decision last Wednesday to withdraw from the US-led anti-ISIS coalition. The federation's official WAM news agency said Abu Dhabi Crown Prince Mohammed bin Zayed al-Nahayan, deputy head of the UAE armed forces, had ordered the move, reports AFP. "The initiative...reaffirms the UAE's unwavering and constant solidarity with Jordan and its leading role and immense sacrifices for the security and stability of the region as embodied by martyr and hero Maaz al-Kassasbeh," the Jordanian pilot burned alive by ISIS, the agency reported. WAM said the deployment was aimed at supporting Jordan's military in the fight against "the brutal terrorist organisation" ISIS, without specifying the number of aircraft involved or their role. It said the jihadist organization "showed all the world its ugliness and violation of all religious and human values through abominable crimes" that caused "outrage and disgust" among Arab peoples. After Kassasbeh's warplane crashed in Syria in December and following his capture by ISIS, the UAE withdrew from the US-led coalition's strike missions over fears for the safety of its pilots. However, a US official said on Friday, after US Secretary of State John Kerry met Gulf ministers in Munich, that UAE flights were likely to resume "in a couple of days." Abu Dhabi had also "reaffirmed its commitment to the coalition" brought together by the United States to try to defeat the terrorists who have taken over a swathe of territory in Iraq and Syria. Another US official said that among all the Gulf countries the pilot's brutal immolation by ISIS "has been a unifying event doubling their resolve to take the fight to Daesh," using an Arabic acronym for the terror group.